Jim McInally is still in the market to add to his Peterhead squad after Craig Thomson opted not to join the Blue Toon. Thomson was free to leave League 1 side East Fife and McInally had made him an offer to move to Balmoor, however he opted to join Brechin City instead. Peterhead have added Ryan Dow this month after his departure from Ross County but have also let Ross Kavanagh move to Brechin. Goalkeeper Sam Henderson also joined as replacement for Ryan Gibson, who returned to Queen of the South after a loan spell. 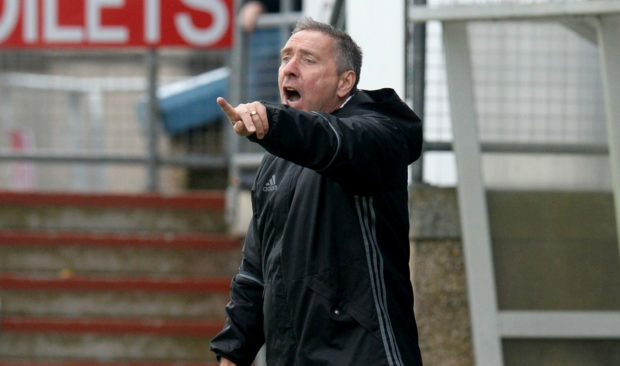 McInally said: “We need someone to bolster the squad. We’ve not got the biggest squad and while I’m happy with the quality, if we had a run of three games in a week we might pick up injuries. We’ve still got the month after this for loans. McInally has also recalled teenage midfielder Ross Willox, who had been on loan at Lowland League side East Stirlingshire after joining the Blue Toon in October. Willox was on the bench for the victory over Berwick Rangers last week and McInally hopes to get him introduced into the first-team as soon as possible. Peterhead travel to Galabank today to face Annan Athletic, starting from the League 2 summit after the Galabankies upset Edinburgh City a week ago. Simon Ferry (knee) is out but Jamie Stevenson is fit, while Rory McAllister (back) will be monitored prior to kick-off. McInally added: “First and foremost, we need to get him right. We need him to play without pain. He was running about for 20 minutes against Albion Rovers in agony and we can’t be doing that every week.